I was recently asked by friend and aspiring artist James Trundle to help with and document the installation of his latest sculpture. After hearing more about his concept, there was no way I could pass up the chance to be a part of the project. James is now studying at The Slade School of Fine Art in London, but graduated form Durham University with a First class degree in Natural Science and obtained a distinction in his foundation year at Central St. Martins College of Art before being accepted to The Slade. His current work tries to fuse these two facets of his training: the academic and the creative. He is particularly interested in the void created by “the demise of religion” and whether or not art is a valid substitute for faith. His most recent projects are aimed at creating alien compositions within a landscape, installations which are temporary and later only exist as thought (and incredulity)-provoking photos. Compositions that should probably remain in the realms of photoshop are physically brought into being in these installations. 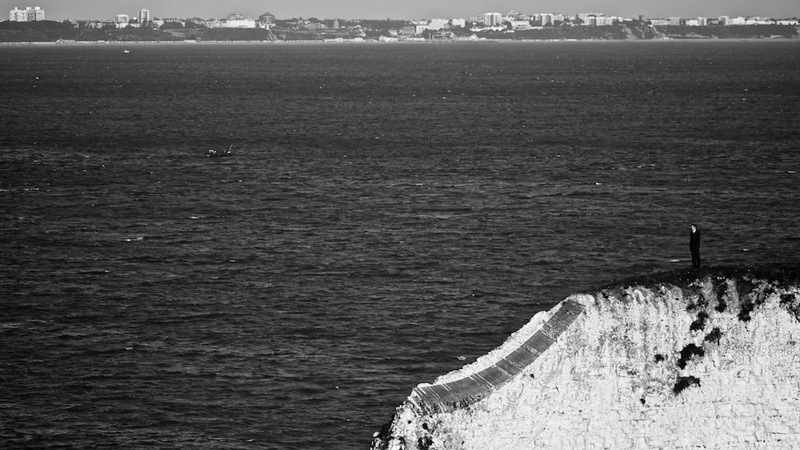 Lost and isolated on a stack, with a bridge stretching tentatively to the mainland, this composition is intended as a questioning device; is the businessman trying to escape? Is he being rescued? Why is he there? Is that where he belongs? It is not simply an alien and unexpected composition but also the vehicle for a metaphorical narrative commenting on the state of the economy and of art itself. James’ recent experiments with self portraits also beg questions about the loneliness of the artist and their position of limbo between art and business: is today’s modern art more about business than art? You can interpret the piece in many ways, and it should have a different meaning for each viewer. Art should be more than instant explanations and answers in the palm of your hand. Rather, it is each individual’s experience of the composition which, to me, makes the piece art. 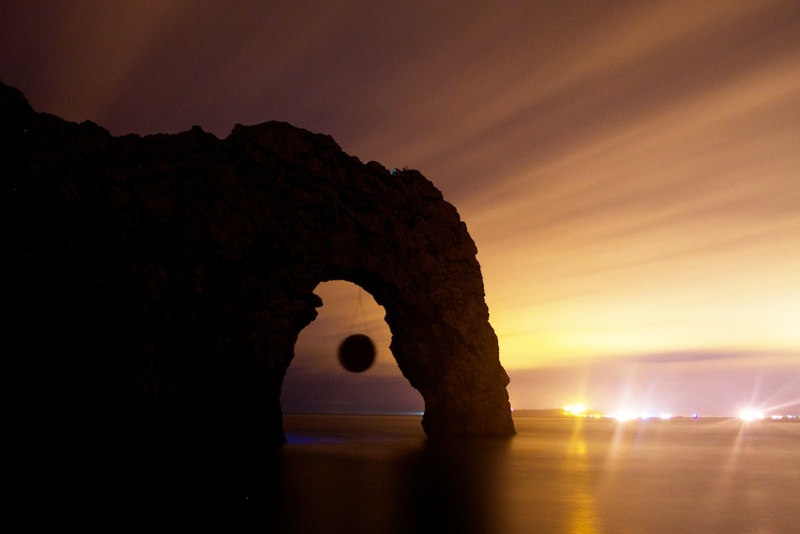 On a similar theme to the bridge, we hung a 10ft disk in the centre of Durdle Door Arch. The whole Installation was carried out in one night, with the disk being removed by three in the morning and no sign of it left behind. Not everything went to plan, the disk took a dip in the sea, rendering the electrics completely useless. Backlighting was instead achieved by abseiling behind the madly flapping disk with a head torch. The strong wind meant that the disk was moving so much that it is hardly visible in the two minute Exposure necessary to capture the scene.